DisneylandRecords.com was launched in 2011 as an opportunity to share information about the vast catalog of Disney music on vinyl records. Since a majority of Disney records were issued by Disneyland Records for a period that spanned nearly 35 years, DisneylandRecords.com was chosen for the site's domain name. However, this site can also be reached at the shortened address of DisneyLP.com. The Disneyland Records company was formed in 1955 after several years of Disney Studios licensing their music to other record companies such as RCA, DECCA and Capitol Records. 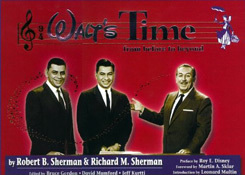 The first record issued with the Disneyland label was "A Child's Garden Of Verses" which, as noted on the album's cover, includes contents from Walt Disney's Mickey Mouse Club television show. Unfortunately, some of the early issues of this record were not numbered and can only be referenced by its unique 10" size and matrix numbers EB-1347/EB-1348. Later issues received the catalog number WDL-1001. In 1989, Disneyland Records changed its name to Walt Disney Records and continued the Disney music legacy in digital form on Compact Discs. Only vinyl records are cataloged on this site and include those from Disneyland Records, Buena Vista Records and other non-Disney companies that issued records with at least 50% Disney content. Additional listings will be added to this site over time, so please check back often. This site is 100% fan-based and is not run by the Walt Disney Company. All record images are from a private collection and are posted on this site as a reference to other collectors. Some images are copyrighted and should not be reproduced without written permission. At this time, DisneylandRecords.com does not suggest that this site provides a complete reference to all Disney vinyl records. The research and archiving process is planned to continue for quite some time. Additional references can be found in the books listed below that will provide a wealth of information on Disney music and vinyl record collecting. For each record displayed on this site, the following information has been included to help collector's identify the item and learn more about the record from additional details that may not be contained on the item itself. Artists: This field includes the artists listed on the record sleeve or label. In cases where the contributing artists are not included on the record sleeve or label, additional known artists will be added. When artists are listed as the character from the production, the actual person playing the role will be listed. Label: This field identifies the brand or trademark associated with marketing the recording. In some cases where the label or logo is changed slightly throughout the years of production, the most commonly used or a standardized version of the label name will be listed. Catalog #: This field includes the catalog number found on the record cover. When the catalog number on the record cover does not match the one on the record label, both numbers will be listed in this field separated by a slash. The cover number will appear before the label number. In some cases, other areas of the sleeve may include a slight variation on the record number. These occurrences may be noted in the Record Comment section. Additionally, some spaces in record numbers may be omitted or converted to a dash for consistency throughout a particular series. Country: This field includes the country from where the record was issued. In some cases, this may not be clear when the manufacturing of the record includes more than one country. Additional details for these items may be included in the Record Comments section. Format: This field includes a combination of three items; 1) the disc size, 2) the type of sleeve used to house the disc and 3) the type of disc. A full list of format descriptions used on this site can be found in the section below titled Format Information. Speed: This field includes the speed required for proper playback. RPM stands for Rounds Per Minute necessary for the record needle to make one complete trip around the record's surface. There are three speeds listed in this section; 1) 33 1/3 RPM, 2) 45 RPM and 3) 78 RPM. Audio: The field includes the audio playback as either Mono or Stereo. Since records were originally produced exclusively in mono, the introduction of stereo vinyl did not play on some of the mono record players. Throughout most of the '50s and 60's, it was very common for a record to be issued in both mono and stereo versions. In most cases, the stereo versions are more desirable to collectors as it greatly enhances the listening experience. Note: Disney Studios was the first to produce a stereo soundtrack for theaters in 1940 with their release of "Fantasia." The term "Fantasound" was created for their unique process of adding an additional four-track film that included a left, right and center channel for audio with a fourth track that controlled the volume. The term "Fantasound" was also used for a line of records on their Buena Vista Records label. However, the first "Fantasia" record was released in mono. The first Disney stereo soundtracks were issued in 1959 and includes STER-4018 "Walt Disney's Sleeping Beauty." Since the contents for this record were originally recorded in 1957, it can be considered as the first stereo soundtrack. Year: This field includes the year the record was issued. It's possible that this date may only be an estimate as some of the dates found on the records are the copyright date of the artwork that may actually proceed the release of the record. In some cases, the year may be left blank when no official date can be confirmed. Matrix #: This field includes the alphanumeric code stamped or hand-written in the non-groove area of the record between the last track and record label. This area is also referred to as the "dead wax." The matrix number was originally intended for internal use of the issuing record company to identify manufacturing details. Today, the matrix number can provide information to collectors about the edition and other issue details. Since some of the codes may include symbols along with hand-written text, the characters listed in this field may vary slightly from the actual code on the record. Side A and B matrix codes are listed in this single field separated by a slash. Record Comments: This field includes additional information about the record that may not be included on the item itself. Some notes include information about a particular series or other editions that may exist. Subject Notes: This field includes information about the subject matter of the record. For example, for a movie soundtrack recording, the film's release date and running time may be included. Record Contents: This field includes a listing of the tracks included on the record. The tracks are listed numerically regardless of how they are listed on the actual record. The list includes both sides of the record as one complete list. When a record includes various artists, the individual artist may be listed after the song title separated by two dashes. The time listed is an approximate value. When available, the actual time listed on the record will be used. When no time is listed, the time code found in the digital transfer will be used. Disney records were released in a variety of formats. This list includes the key for the format descriptions used on this site. The format field includes three parts - size, cover and disc. This portion of the field includes the approximate width of the disc. Boxed: A boxed set will usually include multiple discs housed in a box. The box lid may be attached and will open like a book. Clear Sleeve: A clear sleeve cover is typically made from plastic and is used for some picture disc records. Die-Cut: A die-cut sleeve will include a portion of the cover removed that exposes part of the inside contents. An example of this can be seen on Picture Disc records or Magic Mirror Story Tellers. Envelope Mailer: An envelope mailer is typically used for promotional and mail-order records. Some sleeves may contain artwork and other inserts. These items may also contain the original addressee information and tearing that may have been necessary to remove the record from the sleeve. Gatefold: A gatefold cover will open in a book format with photos, illustrations or text that will provide additional information about the record contents. No additional pages are attached. Gatefold covers are also commonly used to house multiple disc sets. Gatefold Book: A gatefold book cover will open like a book and will contain additional pages attached to the center. The additional pages may contain photos, illustrations or text that provide additional information about the record contents. Gatefold Mailer: A gatefold mailer will open like a book and is designed to be addressed for mailing when closed. Gatefold Story Teller: A gatefold story teller cover will open like a book and will contain additional pages attached to the center. The pages will contain photos or illustrations with text that follows the narration heard on the record. Some of these issues, especially the 7" size, are also referred to as a "See, Hear and Read" record. Magic Mirror Story Teller: A magic mirror cover opens in a book format and includes an oval-shaped window on the front that reveals inner storybook pages. Non-Picture Sleeve: A record without a picture sleeve may be housed is a plain, generic paper sleeve or one containing only the record company logo. Standard: A standard cover will only open at the top or right side for removing the record. The front and back cover will usually contain illustrations or photos. 2-Disc EP Set: A 2-disc EP will include two extended play records where each disc usually contains three to six tracks. 2-Disc LP Set: A 2-LP set will include two long play discs where each disc usually includes about ten or more tracks with content lasting close to 15 minutes or more per side. An LP is usually considered a full album. 2-Disc Single Set: A 2-disc single set will include two discs where each disc usually contains one track on each side. It is commonly an expert from a full album or LP. 3-Disc EP Set: A 3-disc EP will include three extended play records where each disc usually contains three to six tracks. 3-Disc LP Set: A 3-LP set will include three long play discs where each disc usually includes about ten or more tracks with content lasting close to 15 minutes or more per side. An LP is usually considered a full album. 3-Disc Single Set: A 3-disc single set will include three discs where each disc usually contains one track on each side. It is commonly an expert from a full album or LP. 6-Disc EP Set: A 6-disc EP set will include six extended play records where each disc usually contains three to six tracks. EP: An extended play record will usually contain three to six tracks. This is more than a single and not enough to be considered a full album. Flexi-Disc: A flexi-disc is made from thin plastic or cardboard and is commonly found among promotional, mail-order and premium items such as records cut from a cereal box. In most cases, the content will only be on one side of the disc. LP: A long play record will usually include about ten or more tracks with content lasting close to 15 minutes or more per side. An LP is considered a full album. Orange Vinyl EP: An orange vinyl extended play disc will usually contain three to six tracks pressed in orange vinyl. Orange Vinyl LP: An orange vinyl long play disc usually includes about ten or more tracks pressed in orange vinyl. An LP is considered a full album. Orange Vinyl Single: An orange vinyl single will usually contain one track on each side pressed in orange vinyl. It is commonly an expert from a full album or LP. Picture Disc LP: A long play picture disc will usually include a photo or illustration placed on both sides under a clear vinyl pressing. An LP is considered a full album. Picture Disc Single: A picture disc single includes a photo or illustration placed on both sides under a clear vinyl pressing. An single usually contains one track on each side. Red Vinyl LP: A red vinyl long play disc will usually contain about ten or more tracks pressed in red vinyl. The contents are usually close to 15 minutes or more per side. An LP is considered a full album. Yellow Vinyl LP: A yellow vinyl long play disc will usually contain about ten or more tracks pressed in yellow vinyl. The contents are usually close to 15 minutes or more per side. An LP is considered a full album. Single: A single will usually contain one track on each side. It is commonly an expert from a full album or LP. Yellow Vinyl Single: A yellow vinyl single usually contains one track on each side pressed in yellow vinyl. It is commonly an expert from a full album or LP.